In the 1990s, Africa saw the largest emigration of skilled people in the world. Similar brain drains have hurt other regions over the last decade, but Africa has enjoyed a silver lining in the form of a large increase in internal investment, in part down to close ties between migrants and their families back home. Remittance income has not just sustained Africa but is fuelling growth and, significantly, industrialisation on the continent. The Economic Commission for Africa (EAC) and the African Union Commission (AUC) have highlighted how important remittances are as a form of funding. In a paper released last month after a joint conference, they placed great emphasis on external funding in helping drive African industrialisation and internal investment. Remittances are second only to foreign direct investment (FDI) in the Horn of Africa (and are actually higher in some countries), and 50 per cent greater than official development aid (ODA). In the push to fill Africa’s much-discussed infrastructure gap, remittances are a vital piece in the jigsaw. This capital inflow is an essential aspect of Africa’s growth journey, allowing private individuals to buy into the economy and have purchasing power. It is estimated that Africa now receives $60 billion a year in remittances. According to a recent report by Send Money Africa, part of the World Bank-partnered African Institute for Remittances (AIR), this figure has grown dramatically over the past decade. In sub-Saharan Africa, money sent from overseas has kept many families out of poverty. In some of the more prosperous areas of the region, surplus income over and above what is needed for basic survival has helped to fuel growing consumer economies. Investment in property, construction and business start-ups has accelerated in recent years, kick-starting the economy from the ground up. The power of remittances can be seen especially clearly in the Somali territories, which are still recovering from the central state’s collapse in the early 1990s. Since then remittances have in many ways underpinned the economy, with sectors such as livestock trading, money transfer, telecoms and construction all thriving against the odds. As the diaspora grew, remittance channels became more formalised and the increasing flow of funding maintained consumption and capital for growth. The history of our company, Dahabshiil, has been closely tied with the Somali experience of migration and remittance. As people have left their places of origin, the need for reliable and efficient money transfer has grown. 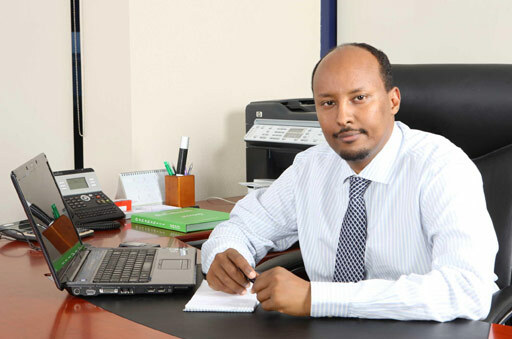 As a result, Dahabshiil has become a leading remittance provider in Africa. Our company’s expansion illustrates how crucial remittance income has been for people’s survival, and how it is now being channelled into private enterprise and industrial growth. As it diversifies, the Somali economy offers a good example of one in which remittances have kept the private sector growing in the face of great challenges. It is now positioned it to reap the benefits of the newly won stability in the region. One of the main factors allowing African economies to evolve has been the ICT revolution taking place within the context of an increasingly reliable communications network. Remote areas are no longer ‘out of the loop’ and as increasing numbers of people can afford computers and phones, many are enthusiastically embracing modern technology for the first time. Previously isolated regions of the continent are now online, allowing for the exchange of ideas and the ability to coordinate commercial activity in ways that would have been impossible a decade ago. Beyond the direct impact on start-up enterprises, it is also part of a trend towards the uptake of more consumer goods, boosting retail and GDP for many countries. Consumer booms have always fuelled development, and Africa’s growth path is proving to be no different. In the Horn of Africa, these advances have allowed remittance firms like Dahabshiil to diversify out of their traditional business area and offer a full range of financial services to private and corporate clients. The growth of such services is to be welcomed; they grease the cogs of an open economy. A fully fledged banking sector has to precede functioning debt and equity markets through which investors and entrepreneurs can find each other. Capital market development is proving to be a major challenge, especially in sub-Saharan Africa, but growing investment from overseas, including from the diaspora, is beginning to have a positive impact. While there is clearly a sea-change underway on the continent, this is no time for complacency. There are still many barriers to Africa’s growth and much more should be done at state level as well as in the private sector to create the level playing field economies need if they are to take off. But as living standards continue to improve and stabilise, Africa can begin to power its own growth and industrialisation, moving away from its overreliance on agriculture and raw materials. With a global downturn hurting many Western players who have traditionally invested in Africa, remittances are likely to assume an increasingly important role in this process. And with the rise of skilled employment, Africans around the world who have built successful careers and educated their offspring will be incentivised to return in search of competitive incomes, bringing with them the knowledge and expertise needed to take Africa’s development to the next level. Diaspora involvement is just one part of the solution but there is no doubt that it has been a decisive factor in the survival of the less developed regions of the continent. As the EAC and AUC highlighted last month, it must be recognised as a potent force for growth, and harnessed accordingly.